Yes, there's still plenty of snow here and at this rate, the big thaw is going to coincide with snowdrop season! There are many wonderful gardens here in Britain which have spectacular snowdrops and well worth making a special trip to see .... because there's nothing more bewitching than an endless vista of nodding white heads in the sunlight. I've never been brilliant on different plants (and make no bones about it! ), but I do know that those gardeners who grow snowdrops are passionate about this tiny plant, with the genus name "galanthus", and they will travel far and wide to see them in bloom, especially if there are rare examples in the collection. 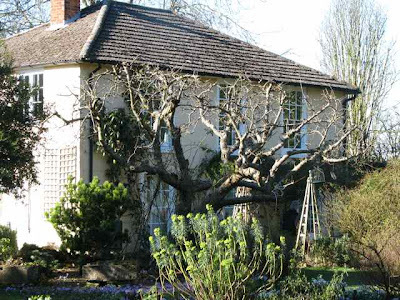 Brandy Mount House (above) at Alresford in Hampshire, is famous for its National collections of galanthus (more than 200 named varieties) and daphnes and is open on three days in February (3rd, 6th and 7th). 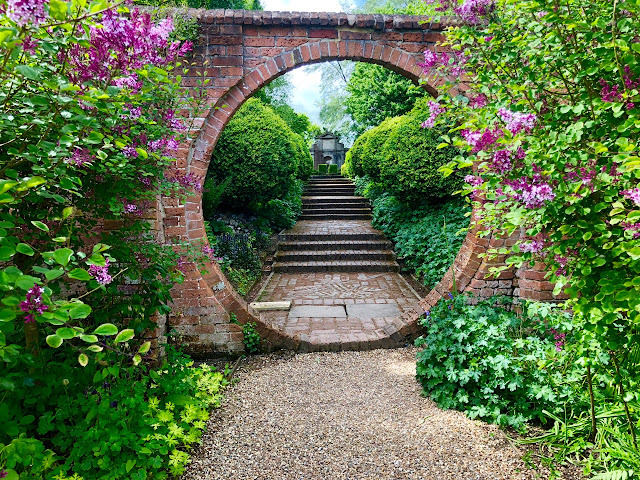 A charming property and the garden extends to over an acre in the middle of this lovely Hampshire town, so you can make a day out if you're visiting and have lunch in one of the many pubs here. Owner Michael Baron is always on hand at open days to answer questions about his collections. Another well-known galanthus spot is East Lambrook Manor in Somerset (right), former home of writer and plantswoman, Margery Fish, who created her much-loved cottage garden here. You'll find many unusual plants here, throughout the year, but February brings the drifts of snowdrops. 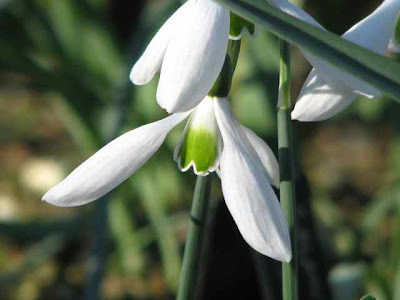 For a comprehensive list of galanthus openings elsewhere in England in February and March, visit Great British Gardens which has links to all the properties. Scotland has its own Snowdrop Festival, with a variety of gardens taking part. What nobody seems to be able to tell me yet is whether this very cold spell - with heavy snowfall - will affect the snowdrop displays, so do check the various websites for information if you're planning a visit. Galloping Galanthus, love it! I learn something every time I come to blotanical. I didn't know snowdrops were galanthus nor that there was a snowdrop festival in Scotland. Thanks Charlotte. It is nice to see flowers blooming from the past as we sit in a snowy climate. I too love the term 'Galloping Galanthus' and think it would make a wonderful title for a true Galanthophile! I planted a few of the commonest ones last fall and am anxious to see their progress this Spring. From the look of the various sites dedicating themselves to this Spring ephemeral, this too is another of those bewitching beauties that can lead to a most expensive obsession! 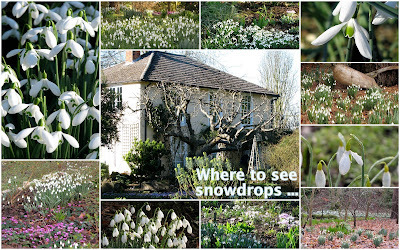 These photos show how lovely snowdrops are, especially your photo where the flowers look like a sprinkling of snow. I had no idea there are so many named varieties. Snowdrops grew along the fence next to the pasture on the farm where I lived once upon a time. Like brave little soldiers they bloomed right through the snow on the ground and were often hard to find with such a good camouflage. A snowdrop festival sounds like such a wonderful time. I don't think there's such thing in the midwest. Thanks for sharing the links, too. I covet snowdrops, but mine are declining. I think I water them too much in the summer. I would love to visit England some day during snowdrop season. Thanks for showing us some of them. Fingers crossed their pretty little snowdrops are fine... I grow quite a few of them and - at least my variety - seems to handle all types of horrid weather. On heavy snow years, the poor things are often blooming underneath the drifts! Now thats an interesting prospect the one in Alresford a bit far for a trip to Margery Fish's garden but I have been there twice and really enjoyed my visits. I found her writing very inspiring when i first had my own garden. Hello Charlotte, add me to the list of those who love the galanthus. We don't have a large display, but adore them nonetheless. I am in love with galanthus! I only have one variety so far but want to get my hands on as many as possible! Great post and pics. Wonderful play on words Charlotte! 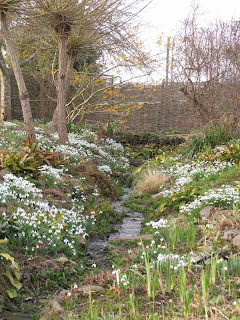 I love snowdrops and would give most anything to be sitting or strolling along the stream at Lambrook Manor. I intend to collect many more varieties of these beauties over the up coming years. These hardly little souls thrive here in the frigid New England winters so hopefully they will be fine across the lands now hit hard by frost and snow. Nice narrative and pics,as always. Pat and I start the front yard garden expansion this spring. snow drops are in the mix. The display of snowdrops will be affected by the cold in the fact that they will take longer to appear, so late January, but this is fine at the Painswick Rococo Garden, which one of the most famous snowdrop gardens a weekly update of there progression is made on their website. Of course once they are up we prefer the temperature to stay cool and the sun to come out sparingly as they prefer this as it prolong's the flowering season. Painswick has a huge collection of G. nivalis in the thousands through the woodlands with good sized planting of others such as G. atkinsii, Flore Pleno, and Lynn Sales. There are some naturalized snowdrops in my yard which have been here since long before I came. They are beautiful, and I plan to transplant some this spring to a more prominent place in the garden. If I dig a big enough chunk of dirt with them, they shouldn't be too disturbed - I hope! Be still my beating heart, I am in love, love, love with snowdrops. I agree with Jodi, snowdrops are not as popular in Canada as they are in the uK, why, I am not sure. I am trying to rectify that by planting and dividing as many as I can every year. One day, far in the future, when I am an old lady leaning on my cane, I will have a snowdrop festival for the (hopefully) thousands I will have. Lovely galanthus, so plenty. I agree with you about people's passion for the snowdrops. While in Turkey we were lucky to be part of a tour to the Snowdrops festival, high up in the mountains through circuitous roads and rockies. 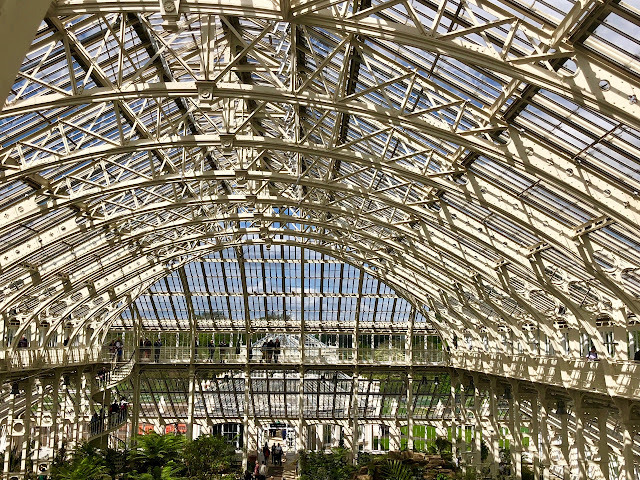 And it really is magnificent especially for tourists from the tropics like us. However, it is the whole escapade and viewing different culture and sceneries which engulfed me, not really the snowdrops which are not so plenty. That photo of the stream at Lambrook Manor is just beautiful.